ank our very generous sponsors of the February event, TechDwellers, Blue Gecko, and Christensen O’connor Johnson Kindness. Each is a terrific supporter of the startup community; please remember to thank them next time you see them at a Poker 2.0 event and in the meantime show them a little Tweet love. February had all of what I love to see at a Poker 2.0 event (prolific networking, awesome food and good times had by all)… and one thing I hate to see (empty seats). I’ll get to that in a second. 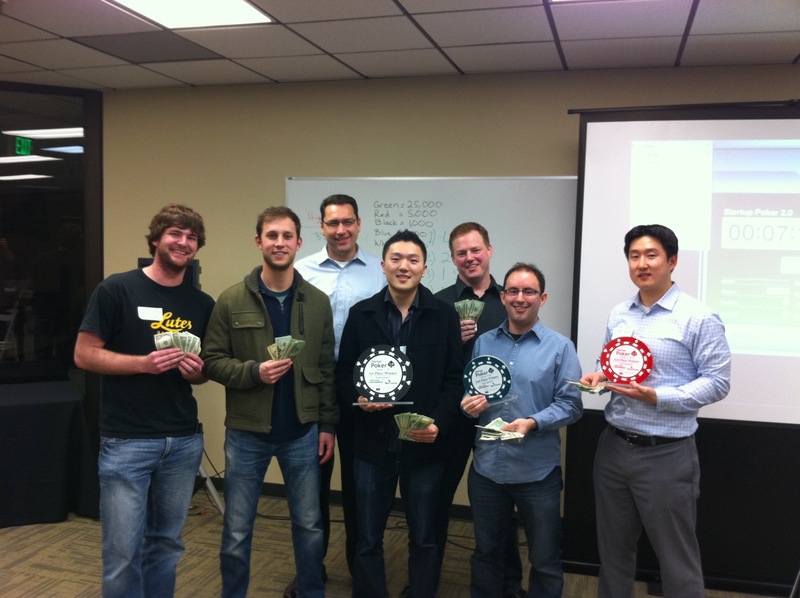 For February, we partnered with Lendio to hold their CrowdPitch event on the same day as Poker 2.0. The winner of the CrowdPitch event was SittingAround.com, an online platform that supports parents who want to start and run a babysitting cooperative. It really is a terrific idea and founder Erica Zidel did a great job with her pitch. One of the prizes Erica won (the best prize, no doubt) was a VIP seat for the Poker 2.0 event later that night. Erica was a really good sport and it was great to have her at the game. She didn’t win any money but based on the banter and business cards that were flying in her direction I’d venture to guess she made some great connections with the startup community. First-out prize went to Alex Lawrence of Lendio… who was so wipe out from lack of sleep that it’s a wonder he could carry out the pretty little pick trophy he won! Now… about that little think that I hate seeing. Here’s the rant…. Each month, when I send out invites to the event, 40 fortunate entrepreneurs and investors earn a coveted seat at the tables simply for being the first to RSVP — usually within 30 – 60 minutes of the invites being sent. And each and every month dozens of folks who’d love to play aren’t able to respond in time to get in and so they take a spot on the wait list. When a conflict arises and one of the RSVPs has to bow out, I give their gift of a seat to the next person on the wait list. There’s usually 3 – 5 seats that open up for each event. It’s all good. But when someone with a reserved seat just doesn’t show up then that’s unacceptable. The February event 11 no-shows with notice at all… they just didn’t show up. I suspect that the high demand for seats has given folks a hair trigger and so there’s a lot of RSVPing before calendars are checked and evenings blocked off. Luckily, we invited some extra folks to the February event just to hang out and socialize and they were glad to take the empty seats… so all we lost was the money wasted on the extra catering and beer for 11 people. So… going forward, if you RSVP and do not show up and you do not send me an email, give me a call or change your RSVP to No, in advance, then your invited for the next event will be delayed by at least two hours. If you commit the foul again then you’ll have to beg forgiveness to get back on the invite list. So go ahead and click Yes as soon as you see the invite but then IMMEDIATELY check your calendar, call your wife, cancel the meeting the governor, arrange for a babysitter… whatever it takes. If you can’t make it then change your RSVP back to No and let someone else have the seat. If something comes up later then let me know right away that you won’t be able to make it so that I can give your seat to the next person on the wait list.